It was while I was carrying out research for my second novel Back Home that I became aware of the problems facing families who had to adjust to living together after having been separated during the Second World War. (Penguin Customer Service Number for Back Home is 0870 607 7600) Back Home tells the story of a girl returning to England from America after five years. Like many shocked, disorientated and lonely sea-evacuees she is faced with bombed streets, rationing, having to live with relatives who are strangers and being expected to behave like an English girl. After its publication a theatre director approached me and told me that evacuees in England also had difficulties living with their families again. He had been sent to Devon where he had lived for years with two elderly unmarried sisters. He had loved his time there and had planned to be a farmer. His father, however, on returning from serving overseas, insisted that he come home and begin an apprenticeship. He was bitterly unhappy. What helped him cope was his evening work at two Variety theatres. The theatres were so close to one another that he could dart from one stage door to the other during performances and that’s when he caught the theatre bug. His story was the seed of my first book about the Hollis family, Cuckoo In the Nest. 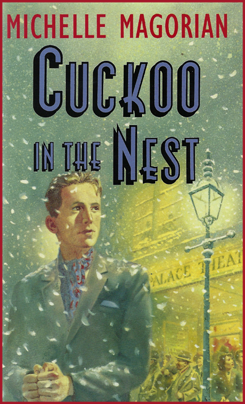 Cuckoo In the Nest is set in the severe winter of late ’46/ early ’47 when England suffered the heaviest snowfall since the 1800’s. Because of the shortage of houses people made homes in abandoned army huts, railway carriages and overcrowded rooms. In the front room twelve-year-old Elsie shares a bed with her seventeen-year-old cousin Joan though she frequently flees upstairs to climb into bed with her two brothers as Joan’s snores can be heard in the next county. The double bed in the room above the kitchen is occupied by Mum (Ellen Hollis) and her ex WAAF sister Winifred (Auntie Win). Ellen’s sons Harry and Ralph share a bed sleeping top and tail in a small room across the landing. During the war Ralph and his brother and sister had been evacuated to Cornwall where they had been separated and taken in by two families. Ralph had been billeted with a vicar and his son. Ellen had missed them so badly that she decided to bring them home. By then Ralph had been offered a place at a grammar school. Realising that this was Ralph’s chance of receiving a good education she allowed him to stay at the vicarage. 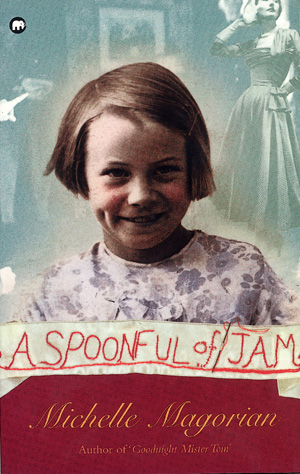 The following book, A Spoonful of Jam is her story and takes place in the heat-wave summer of 1947. By now, Aunty Win has taken advantage of the recruitment drive for the Auxiliary Territorial Service (Women’s Army) removing one less cause of friction. But John Hollis, after years of being with men still finds living with females uncomfortable. Elsie longs for him to pay her some attention and to invite her to accompany him to his allotment, a very male preserve. Instead, he continues to be on the look out for any sign of hoity-toity behaviour from her, convinced she might turn out like Ralph. On the advice of her mother she hides her homework and her borrowed pre-NHS spectacles from his sight. It is for this reason that she feels she cannot tell them about the gang in the next street who bully her. What causes her to be more frightened is that she will no longer have her fourteen-year-old brother, Harry to protect her, as he will be starting work at the paper mill. To avoid being on the streets she auditions successfully for a role in a Victorian thriller, Pink String and Sealing Wax. After working with the company for four weeks, chaperoned by a woman who strides through the streets like a highly cultured Sherman tank she finds the courage to confront the leader of the gang. For those of you who don’t own a computer and are reading this on a website in a library and cannot order books online or who don’t live near a bookshop and are unhappy about ordering on line, members of your group can buy both these books by phoning customer services at Harper Collins on 0844 5768121. Although both sexes have enjoyed A Spoonful of Jam (see Philip Pullman review) it comes with a warning for male readers. The cover gives the impression that Elsie is the kind of girl who wears pretty dresses and is into fashion. This is not so. I have been advised that since a man or boy would be embarrassed to be seen carrying it in public that they should invest in some brown wrapping paper to conceal it! ‘Is there another Hollis book?’ people ask me. There is! Set in 1959, the two main characters are Aunty Win, now a retired and domestically challenged Major and her tomboy working class niece Josie, who doesn’t quite fit into her etiquette bound school. Due to being at the wrong place at the wrong time Josie finds herself flung into the world of Joan Littlewood, the woman who revolutionised acting and who opened the theatre to the working classes. This experience leads to more work for Josie and she and her aunt find themselves fighting for their lives in the polluted waters of the Thames. Divided into three acts the reader sees the world through Josie’s eyes in the first act is taken behind the scenes in the second act and is finally drawn into the gripping filmic third act. For those who can remember the Ealing Films or who are film buffs (and by the way the BFI have just issued archive Ealing films on an eight DVD collections called The Ealing Studios Rarity Collection), the novel has a smattering of the gentle and dark comedy thriller The Ladykillers about it. In my new book, it is Henry who has the cameo role. Having said that, each book can be read on its own. This summer I will be putting together two new talks. One will be based on this article and will include readings from the three books mentioned. The other talk will be a performance reading of an extract from A Little Love Song (ISBN 978-1-4052-3955-4) accompanied by a young musician, George Venner, who will be playing music from the 1940’s. The extract from the latter is called Two Left Feet and Blackout Bloomers. Does this mean you are publishing a third Hollis novel? So exciting. I have read Cuckoo in the Nest so often it’s beginning to fall apart! Thanks for your brilliant books – I love them! Yes – and the new book is out soon! Watch this space…..
Just love all your books and I am in my late 50’s.is there really a 3rd book about the Holis family when is it due out, would love to get it. Love all books about the theatre. Haven’t been able to work out the cameo role in just Henry. Many thanks Jennyp.s are the books set in Portsmouth and Watford?